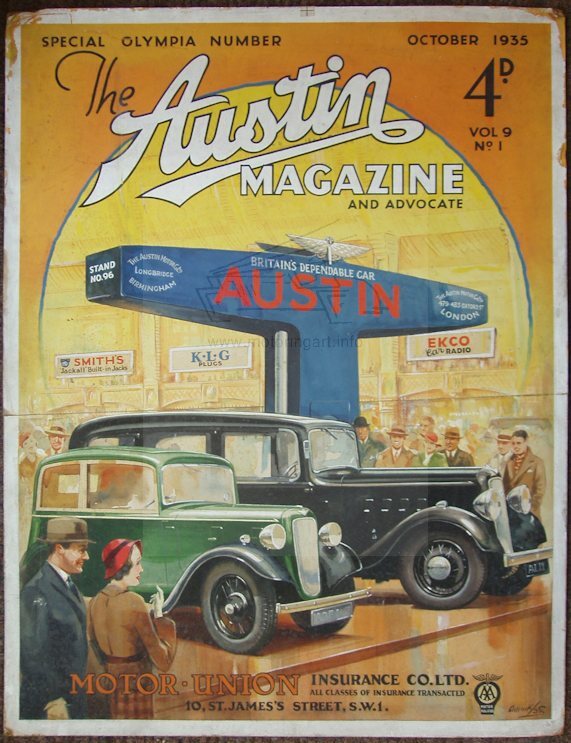 Contact with the family of A Allan Adcock and the listing of front covers for Austin and Morris magazines on the Motorgraphs website has highlighted this artist’s work in the 1920’s and 30’s. For a long time I have had two understandings about Bryan de Grineau - he was born John Bryan and that he did not do any post-war motoring work. Both are wrong! From the researches of Adrienne Bridger we now know he was born (11th May 1883) Charles William Grineau, the son of artist Charles Grineau (who signed his work Alfred Bryan). 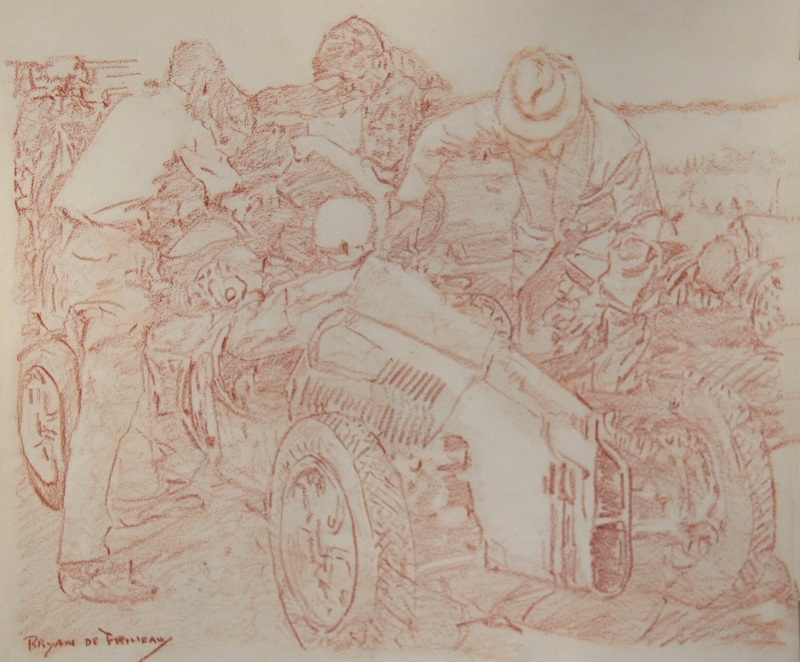 The other development is that four red pastel sketches have surfaced signed by de Grineau, three of them showing 1950's racing cars. There is no evidence that these were ever published and seem to be sketches done for his own amusement in his old age before his death in 1957. 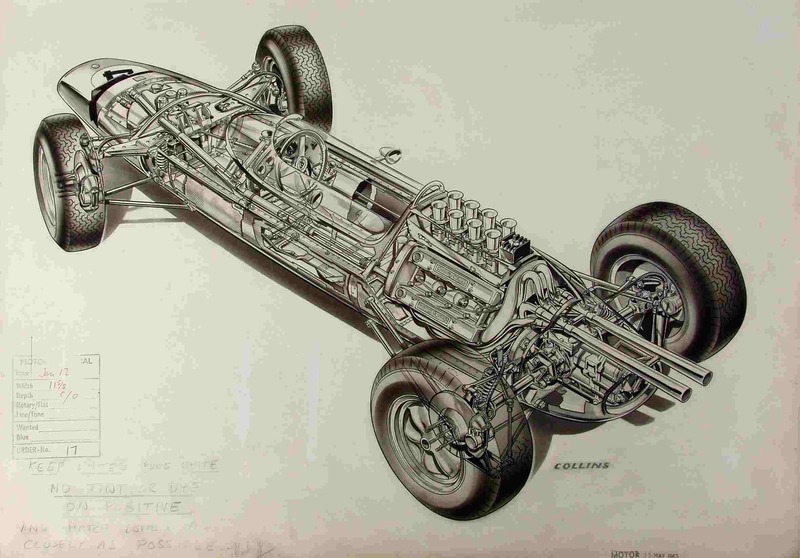 The Cooper 500 sketch alongside is particularly apt in that we have the artist sketching rear-engined lightweight racing cars, where at the start of his career in the 1900's he was drawing the huge monster heavyweight cars. Via Harold Hoftons daughter I have been able to update details on this interesting artist. Alongside is one of his cover designs for a book cover. Thanks to Ken Ball the eminent dealer in motoring books, I have recently been able in inspect a run (1927 - 1939) of The Motor magazine. Seeing these magazines confirms my view that The Motor did not allow their artists to sign the artwork hence it is difficult to determine who was responsible for each cover. This policy is in total contrast to The Autocar where the majority are signed by the artists. 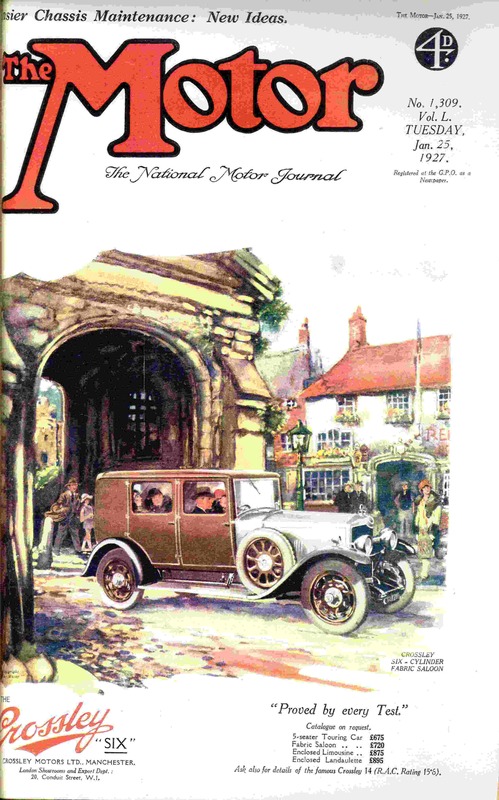 From memory The Motor started using pictorial front covers in 1922/23 and the early covers I have seen in the period up to 1927 are also not artist signed. The exceptions are a couple of Shell advertisements in 1929 by Rowland Hilder, an MG cover of 25th December 1934 by de Grineau and several covers that have the small n monogram of Will Nickless in 1933-36. No doubt the small n slipped past the censor! 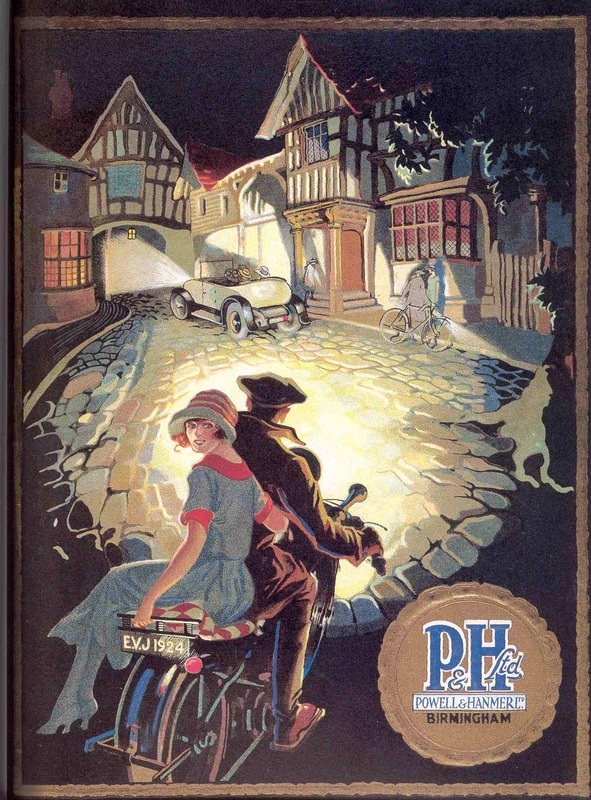 Many unsigned covers are in the distinctive style of de Grineau also works by Basebé, Carr, Connolly, Shuffrey and Steerwood can be attributed. It would seem that the client in many cases kept the same artist for a series of adverts, e.g. 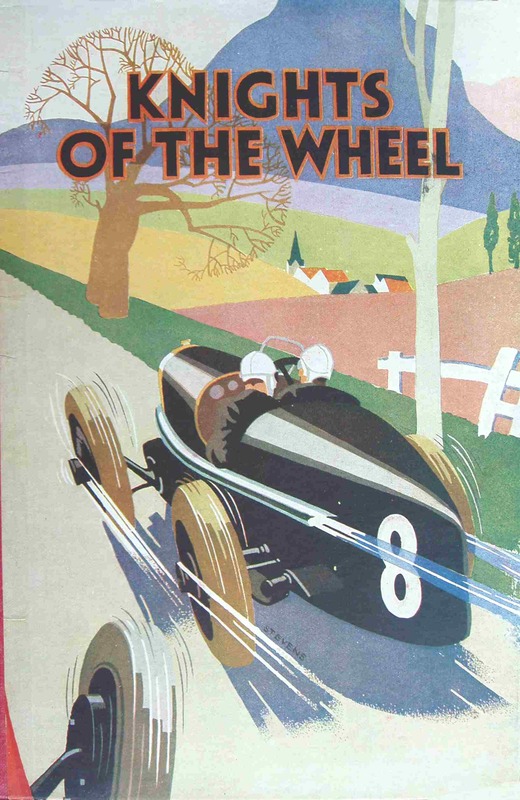 Nickless doing the artwork for Redline Petrol also adverts were often in a distinctive client house style e.g. Ford adverts. The Transport Collectors Sale in October 2008 of the Barrie Blight collection, contained relatively little original art. However, there was a real wealth of printed art used for sales literature, posters and magazine covers. Peter Card has recently sent me copies of some of the images used in the catalogue. The art in the sale was principally 1920's and 1930's by such names as Carr, Shuffrey, de Grineau, Connolly and Steerwood. One name I have not come across before was Gadsby Thorpe who produced a sales brochure for a Morris subsiduary Isis Coachcraft. Michael Reilly was an artist previously in the listing but I did not appreciate that he had produced Morris brochure art of commercial vehicles. Many thanks to Peter I have been able to add some more images in the Artist Listing pages. Morris Car Sales brochure. - Leslie Cat. Image courtesy of Transport Collectors Auctions. I had the opportunity to visit Barrie Pook's shop in Rothley with the vast stock of automobilia. 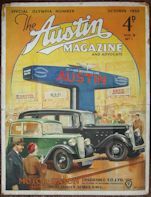 One of the reasons for the visit was to view the 1920's front cover art of The Motor magazine. I did not realise that none or very little of the artwork is signed by the artist. 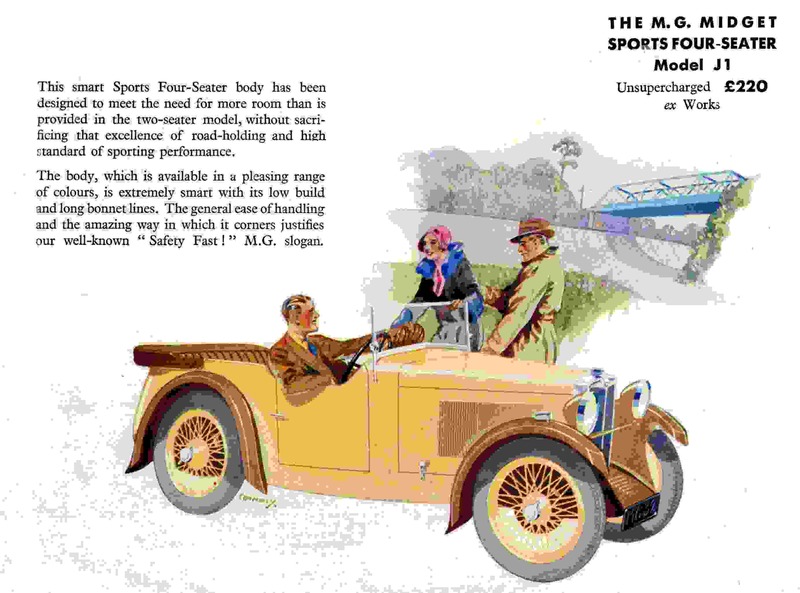 This must have been the magazine's policy, in complete contrast to The Autocar. If anybody has 1920's (or 30's) Motor covers that are signed I would be interested to hear from them. 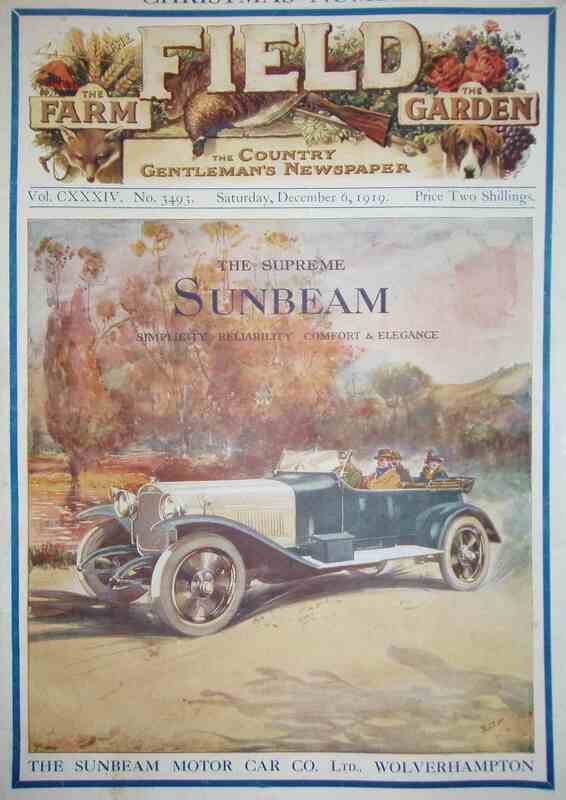 However, several other items caught my eye, particularly this 1919 Sunbeam advertisement cover of the Field by an artist with initials ECF. If anybody knows the full name of the artist I would love to know? 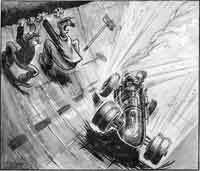 Also thanks to Barrie I have been able to add more images to the Artists Listing for Henry Basebe and Septimus Scott. Plus added new artists Webster and David Tayler. 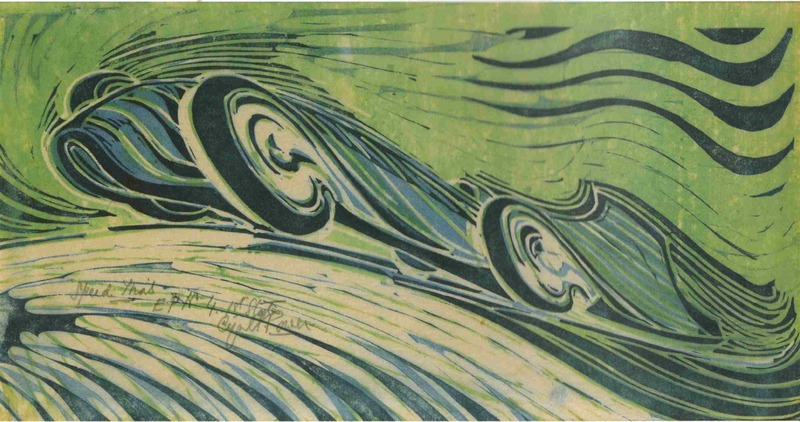 Possibly the most interesting work of motoring art to come on the market recently was this linocut by Cyril Edward Power entitled 'SPEED TRIAL' and shows strong influences of Campbell's Bluebird. This was completed circa 1932 and was a unique experimental proof. This was auctioned by Bonhams in their December sale , where it realised £27,600. There was also a similar example printed in red which had a successful bid of £9,200. Image courtesy of Bonhams auctions. A most interesting find was communicated to me by Rutger Booy of www.prewarcar.com. This concerns the UK artwork of Bernd Reuters the German artist. 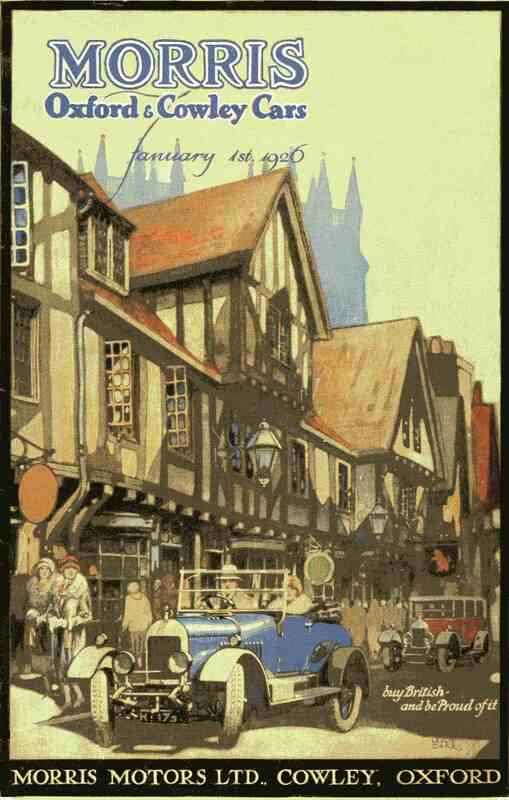 He achieved his main fame with the VW brochure art just after the Second War but he produced earlier art for UK car companies and it is claimed he never travelled abroad! Read about him and see more art in the Artists Listing. In addition I have either added information or made changes to George Bishop, Leonard Clow, S C H Davis, R M Ellis, Walkden Fisher, H C Lovell, Frederic Nevin, Will Nickless, Saunderson, Reginald Shuffrey, A S Waye and Walter Wright. During a recent trip to the USA I had the opportunity to spend some time going through the library of Tom Brierley who has an excellent collection of early illustrated books. This has resulted in a major revision where I have added or revised the artists listing for the following:- D Andrews, Prince Bira, Geo Blow, D F Campbell, L Carr, S J Cash, A Chidley, Brian Cook, Gordon Davies, Roland Davies, E Drigin, Gayler Laurie, GES, Raymond Groves, P B HIckling, Hofton, Norman Keene, Guy Lipscombe, CEM, Thomas Maybank, H R Millar, Reginals Mills, Will Nickless, T E North, S E Porter, Reginald A Shuffrey, Ellis Silas, Stevens, John Wall, R Wenban, W F Wightman. 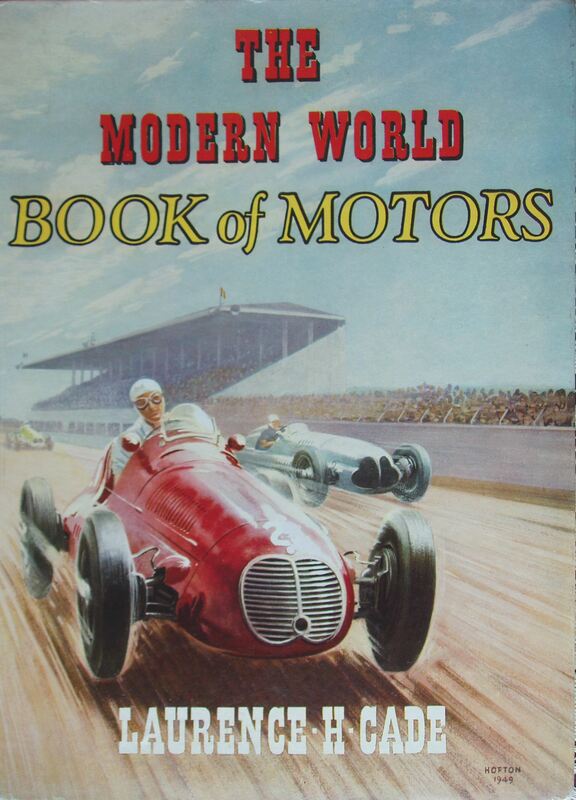 There is some great motoring art in these books of the 1920's and 30's! Thanks Tom for your help! 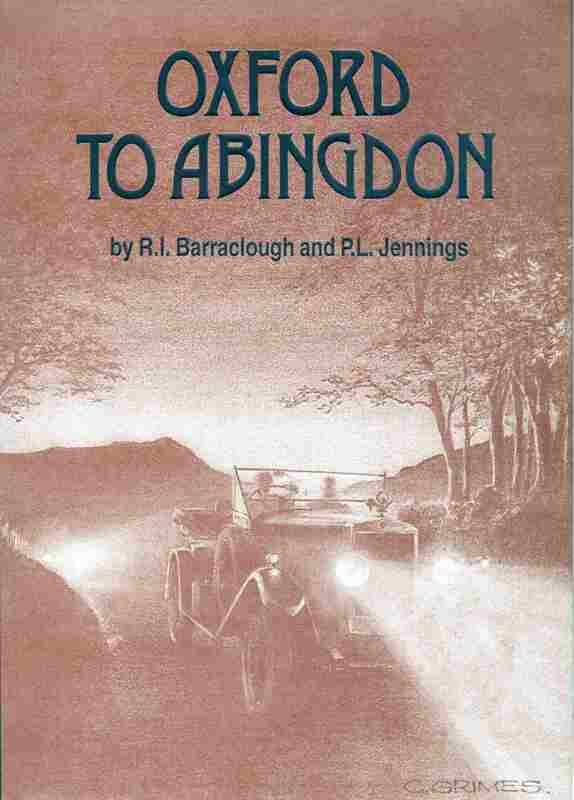 Here is the excellent dust cover design by Colin Grimes for the book OXFORD TO ABINGDON by Robin Barraclough and Phil Jennings published by Myrtle Publishing 1998. With the authors' permission I have been able to use illustrations and update the Leslie Grimes and Harold Connolly details. I have also added W F Burrows and Colin Grimes in the Artists Listing. 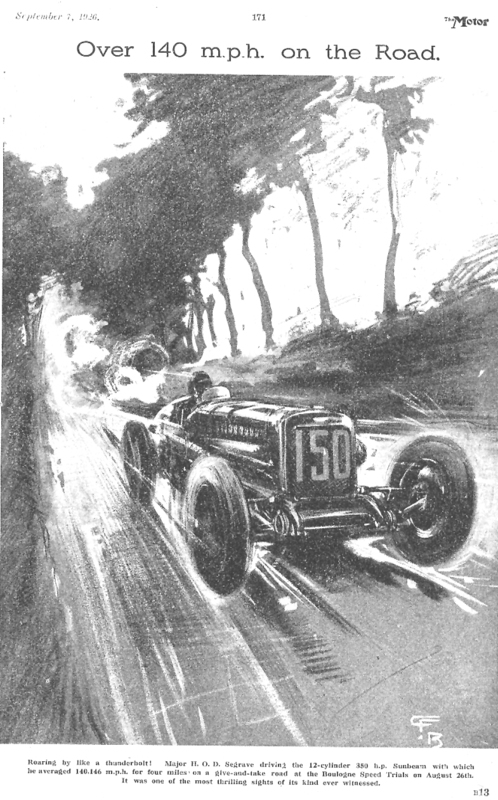 Who is CFB The Motor artist of this 1926 art of the Segrave Sunbeam V-12? 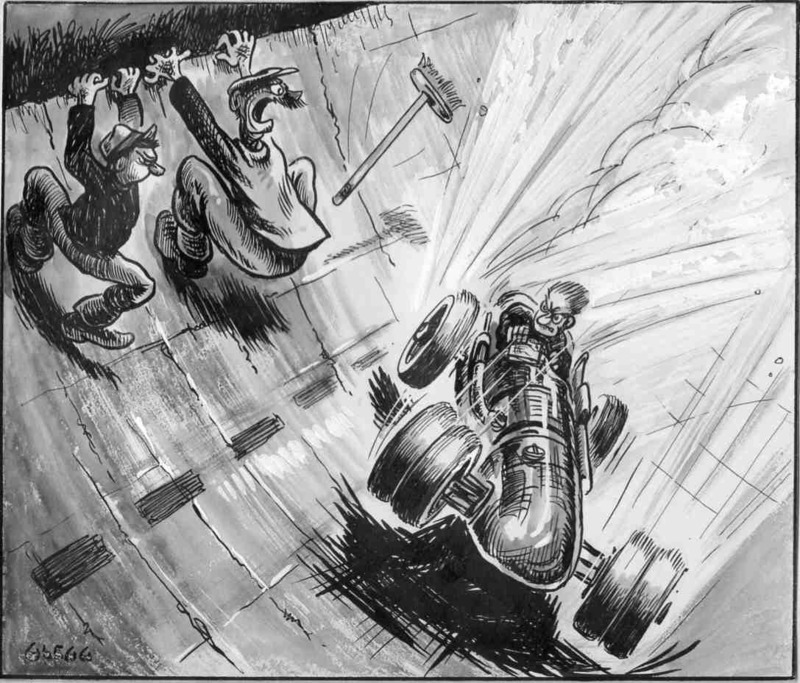 Some slight similarities to the work of Bryan de Grineau who was the staff artist of The Motor. A further thought is that de Grineau's original surname was Bryan, did he have any relatives? Thanks to Michael Ware I have been able to update information on Claude Tipper. Roland Emett and David Weston plus forwarding this image by Evan Jones of the front of the 1924 Powell and Hanmer catalogue. 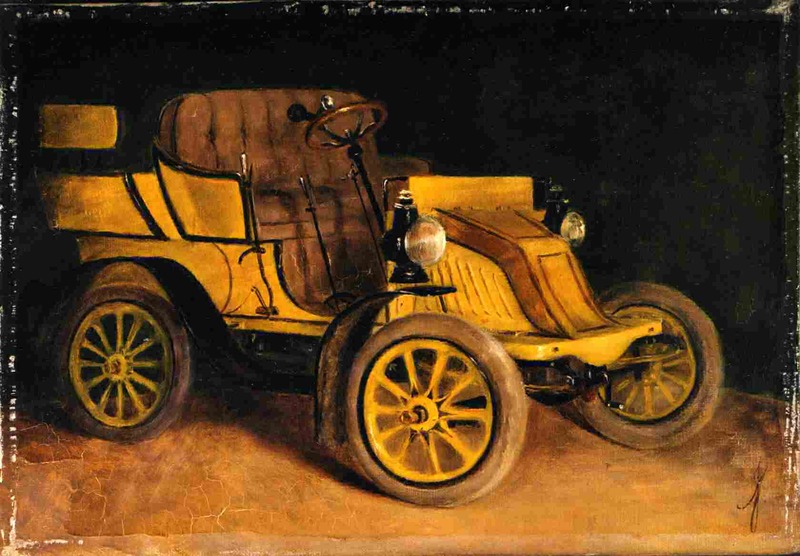 Peter Card was able to advise that it seems Jones worked for P & H from about 1904 to 1925.
Who was the first motoring artist? 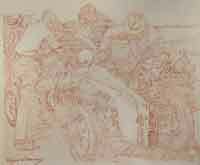 See the artists listing - A Johnson for details of a very early motoring artist! 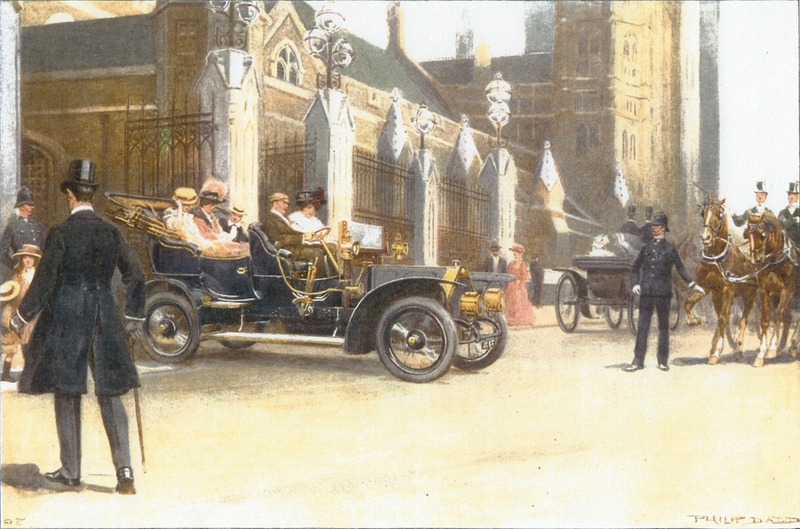 There are two images of early veteran cars and are painted very much in the style that the gentry would have a portrait of their favorite horse! 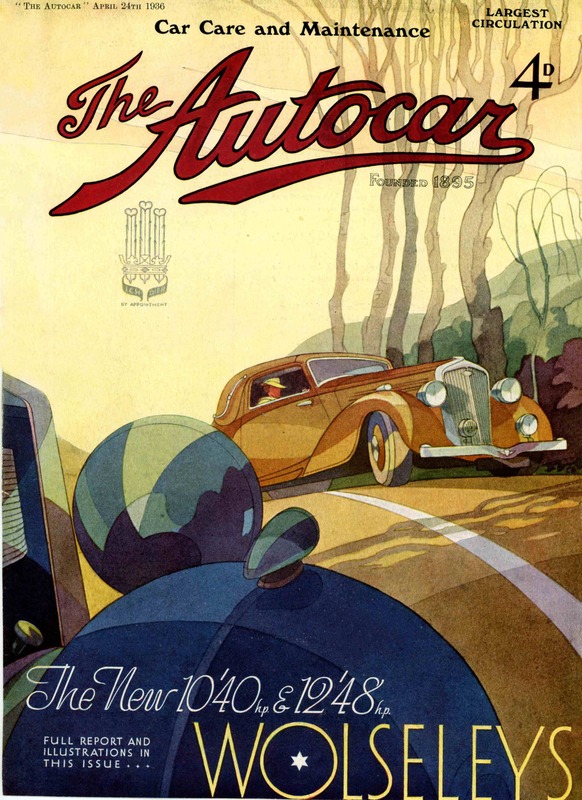 Here with a cartoon by Richard Glegg used by The Autocar in 1941. This is just one of the pages I have updated in the Artists Listing. 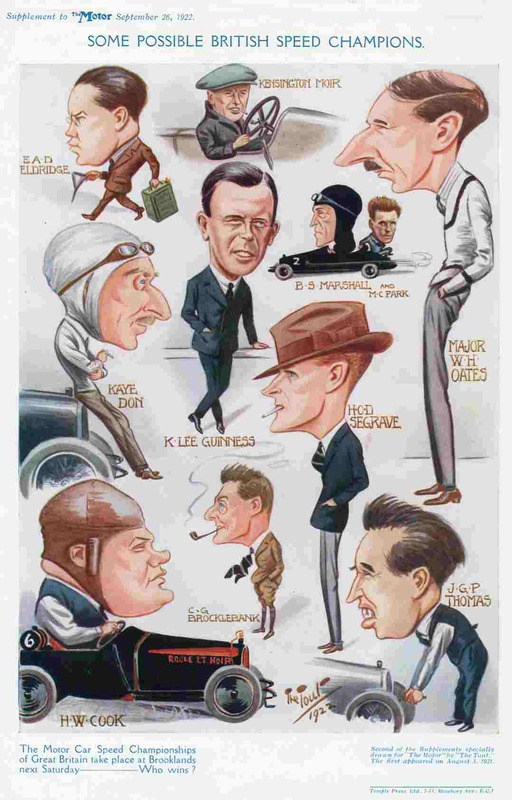 The following have new images R Barratt Granger, Frank Davies, Barnett Freedman, Richard Glegg, Joseph Pike, Tim Slade, William Ross Wardle, Starr Wood and Rex Whistler. I have also added new artists pages for A Brown, Gary Coole, Leonard Holloway, A Johnson, Arnold Lerner, Minoux, J Milner and Van Der Heyden. For some reason I missed Harold Connolly out of the Artists Listing which is surprising as I have just written an article about him for The Automobile. See the listing for details about this very important motoring artist. Although not by a UK artist a recent high was the price paid for a ceramic piece in Bonhams pre-Christmas sale on the 3 December 2007 at Olympia. This glazed terracotta figure of an early motorist entitled "Lighting Up Time" realised £24 000 plus premiums. It was truly a spectacular figure standing some 80 cm high, by an Austrian artist Hamiroff for the Goldscheider factory circa 1905. It was claimed by Bonhams that this design was an unrecorded factory piece so the high price is perhaps not surprising. Talk is that the purchaser is a motoring enthusiast so it was bought for its motoring art rather than the pottery scarcity. Image courtesy of Bonhams.